Among the fairly new crop of suspense/horror/action games, three titles leave the competition so far in the dust it isn't even funny. These games are Resident Evil, Left 4 Dead and Silent Hill, and they have probably done more to raise the collective heart rate of the gaming generation than any Britney Spears video. In this comparison article we take a look at each game and what makes them so hugely popular. Resident Evil was originally known as Biohazard when it was first released in Japan. The game was developed by Capcom and was created by Shinji Mikami. By May of 2009, Resident Evil had sold nearly 40 million copies all over the world. Left 4 Dead is a first-person shooter type of game developed by Turtle Rock Studios, although it was acquired by Valve Corporation during the early stages of its development. The game is driven by Valve's own Source engine, and it is available in numerous versions for different platforms such as Windows, Xbox 360 and Mac OS X. Left 4 Dead was released online on November 17, 2008, and there where copies in the North American stores by the next day. The game was released in Australia, Europe and Japan a few days later. Silent Hill is a video game with a survival-horror theme. The game is under franchise from and developed by Konami, which is also the game's publisher. Resident Evil was first unveiled to the gaming public in 1996, when it was first made available for the Sony PlayStation platform. A Sega Saturn version was quick to follow, and the game rapidly acquired critical and commercial acclaim. Two sequels were then released in quick succession, with both being intended for the PlayStation platform. The game has since been released for numerous other platforms as well. 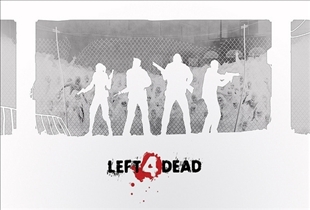 Development work for Left 4 Dead began in mid-2005, when Turtle Rock Studios set out to create a game that was inspired by the horror film genre. The game was first introduced to the public in December 2006 by way of an extensive article in PC Gamer United Kingdom magazine. The first playable version of the game was unveiled at Showdown 2007 LAN and QuakeCon in 2007. Silent Hill for its part is the brainchild of Keiichiro Toyama, and the first version was released for the Sony PlayStation in 1999. Resident Evil has sold nearly 40 million copies by May 2009. Much of its success is attributed to its horror-film elements, puzzle-solving sections, and heavy doses of action. Left 4 Dead achieved similar success, gaining plenty of praise from both critics and gamers alike. By September 2009, Valve claimed that nearly 3 million copies of Left 4 Dead had been sold all over the world. Silent Hill is also equally successful and well regarded, and its graphics, story and brooding atmosphere have earned it critical acclaim as well as commercial success.